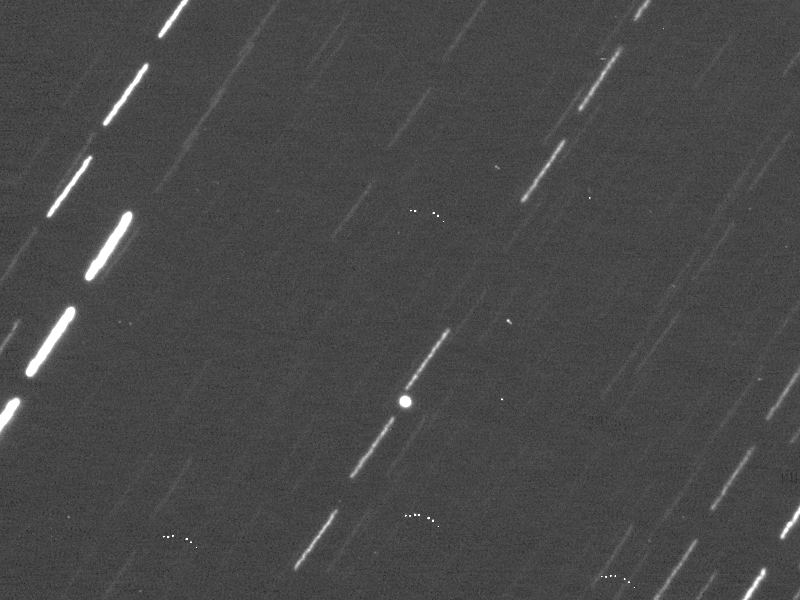 Near Earth Asteroid 2004 BL86 imaged on 25 January using iTelescope T9 at Siding Siring Observatory. 10x60 second Luminance images stacked using ImageJ and SUMMED. 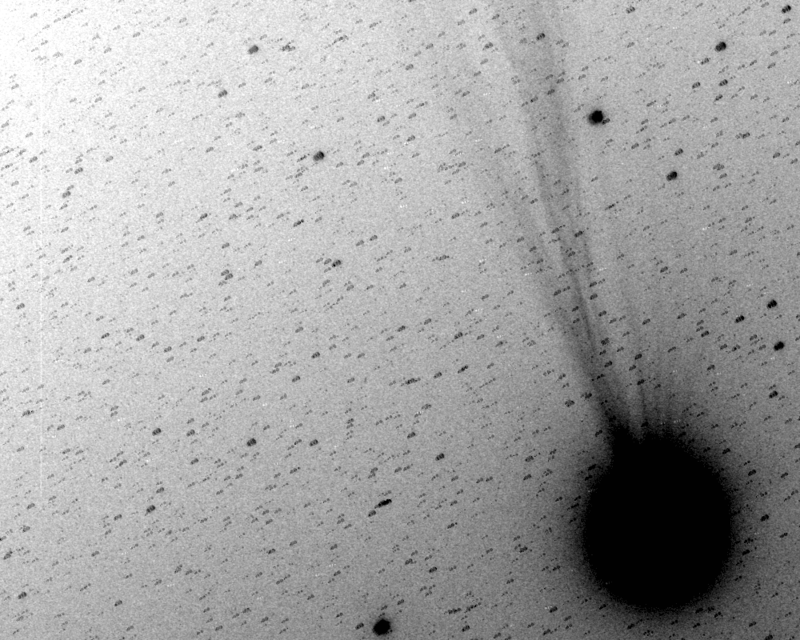 The asteroid is the obvious blob, all the stars are smeared as the scope tracks on the asteroid (the little dots are hot pixels). Click to embiggen. 8 of 10 frames from the 25th animated. The stars stream past, the asteroid stays still and the hot pixels drift to the left. Click to embiggen. 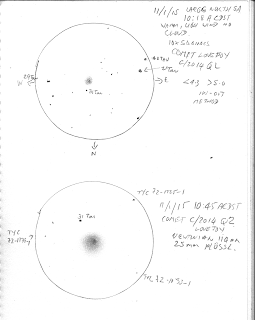 I manage to track Near Earth Asteroid 2004 BL86 with the Australian iTelescope T9 the day before closest approach. On the day of closest approach the scopes in the northern and southern hemispheres were both clouded out. At least I got to see it with my own scope. 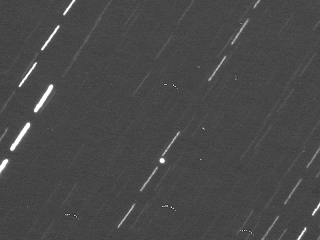 Near Earth Asteroid 2004 BL86 imaged on 28 January using iTelescope T5 at New Mexico. 10x60 second Luminance images stacked using ImageJ and Maxed. 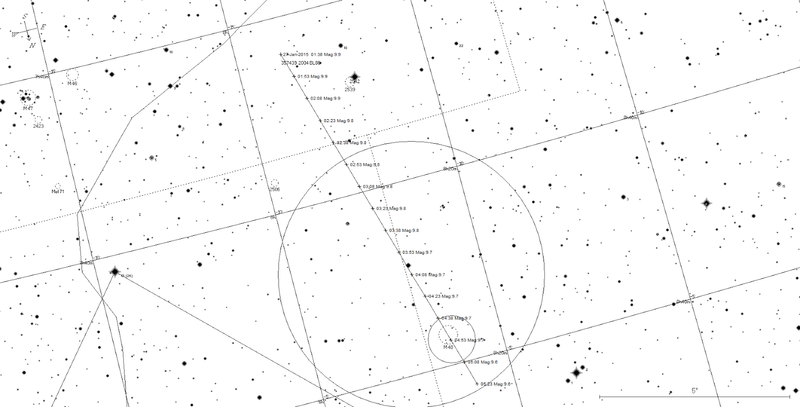 The asteroid is the bunch of short lines, as this scope tracked on the stars. Click to embiggen. 8 of 10 frames from the 28th animated. The asteroid moves as a short line because it is faster than the scope can track and the hot pixels flash in and out. Click to embiggen. After a couple of days of bad weather, the skies cleared for the New Mexico scopes, and I was able to get some nice shots. The apparent "wobble" in the asteroid is due to tracking, not any rotation of the asteroid. The Full Moon is Wednesday February 4. Venus is prominent in the twilight evening sky. 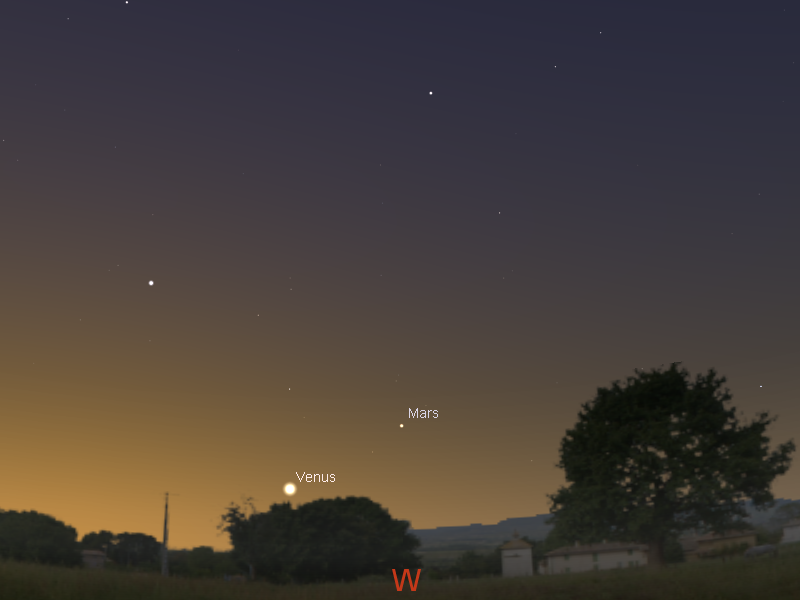 Mars is just visible in the early evening twilight and is coming closer to Venus. 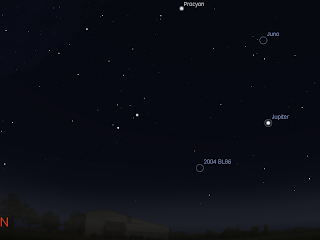 Jupiter is visible in the late evening sky and is visited by the Moon on February 4. Saturn is in the head of the Scorpion. The Full Moon is Wednesday February 4. Evening sky on Saturday January 31 looking west as seen from Adelaide at 21:00 (9:00 pm) ACDST in South Australia. Mars is low in the twilight, with Venus below it. Similar views will be seen elsewhere at the equivalent local time (click to embiggen). Venus is easy to see low above the western horizon in the twilight. At civil twilight, half an hour after sunset, it is around one and a half hand-spans above the horizon. Venus is also a hand-span below Mars. Mars is still seen low in the western evening sky, setting around 10:00 pm daylight saving time (just as twilight ends). Mars is becoming harder and harder to see as it lowers deeper into the twilight. 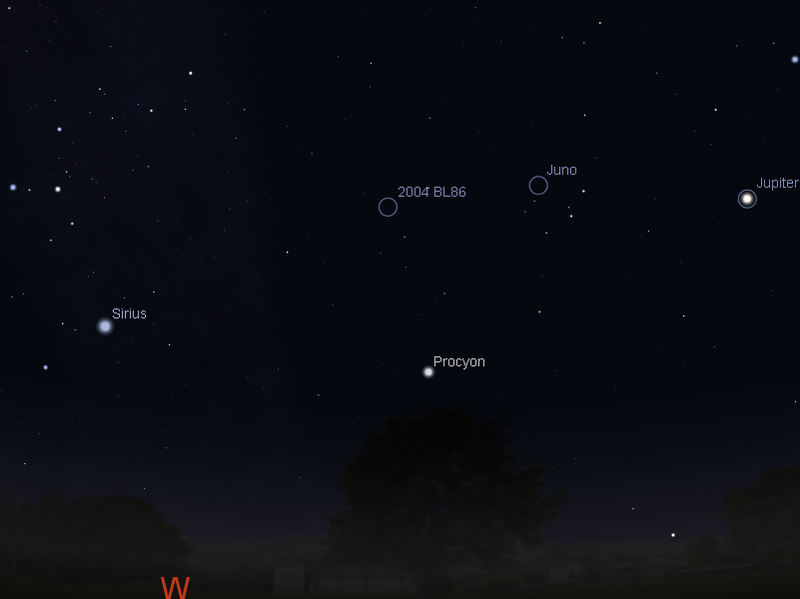 As the week goes on Mars and Venus approach each other, the pair will be closest on the 22nd. Evening sky on Wednesday February 4 looking north-east as seen from Adelaide at 22:00 ACDST showing Jupiter. The Full Moon is close to Jupiter at this time. 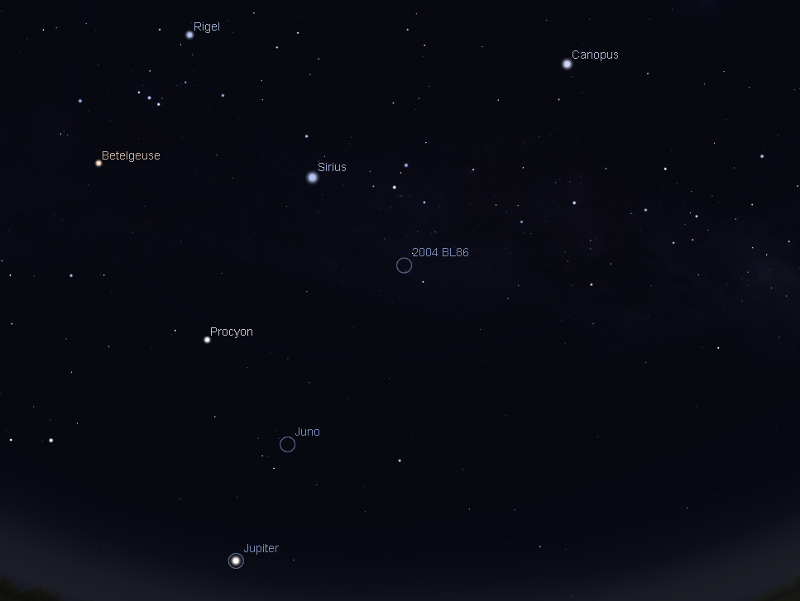 The inset shows Jupiter's Moons at 22:00 on the 2nd. Jupiter is the brightest object above the north-eastern horizon. (click to embiggen). Jupiter is high enough for telescopic observation just before midnight, although its visibility will improve in the coming weeks. Jupiter's Moons will be putting on a good display in both binoculars and small telescopes. On the 2nd Ganymede and its shadow transits the face of Jupiter for around the end of twilight for about an hour. Morning sky on Sunday February 1 looking east as seen from Adelaide at 5:00 am ACDST . Saturn is in the head of the Scorpion, not far from Antares at this time. (click to embiggen). Saturn climbs still higher in the morning sky. It is now easily visible before twilight near the head of the constellation of the Scorpion not far from the bright red star Antares. The sight of the distinctive constellation of the Scorpion curled above the horizon, with bright Saturn in its head, is very nice indeed. Mercury returns to the morning sky this week, but is low in the twilight and will be too hard to see. However, in the coming weeks Mercury will be putting on a decent display. There are lots of interesting things in the sky to view with a telescope. Especially with the comet in the early evening sky. If you don't have a telescope, now is a good time to visit one of your local astronomical societies open nights or the local planetariums. After a busy Australia day of waking up late, walking down the beach to the Australia Day concert to buy ice- creams, a Barbie with friends and watching the fireworks, I set up the telescope to camp out on 11 Puppis to watch the flyby of Near Earth Asteroid 2004 BL86. And failed utterly. I had misunderstood the orientation of the images in to scope, and by the time I had confirmed which part of the image was north, the asteroid was long gone. Once I has sorted my orientation out (with much hopping back and forth to the computer screen inside) I chose the undistinguished star HIP 39095 as my target, as the asteroid passed close to it. 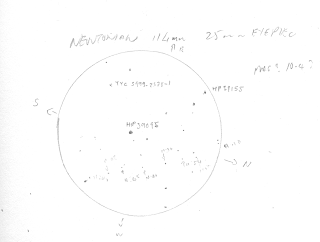 I star hopped down, set up about 10 minutes beforehand, sketched the field (and confirmed that I did have the RIGHT field and which way the asteroid would be going as seen though the scope), then waited. I did a bit of back and forthing to get the areas I wanted directly in the field, with particular stars picked out as the asteroid passed close to them. And then I saw it. Drifting slowly into the field. I really needed averted vision to see it properly, on the basis of the other stars in the field I would put it at around magnitude 10.4, rather than the predicted 10.1 (I could see mag 10.2 stars okay). It was also running about 5 minutes ahead of schedule, but it's track was pretty close to predicted. 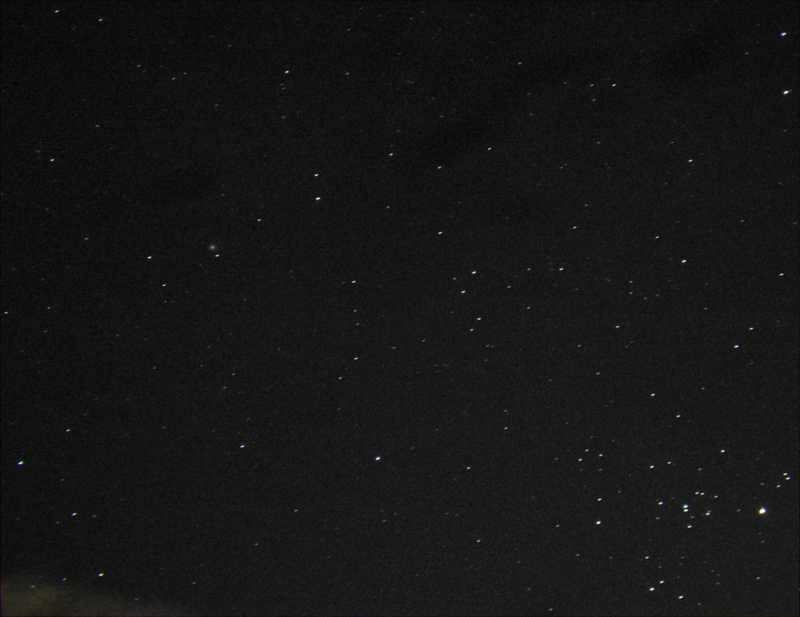 I watched it drift close to, then past, several dim stars in the field, and then out of the field in around 15 minutes. My sketching is pretty rubbish, but is surprisingly close to the actual chart. The spacing of the asteroid positions are not fantastically accurate, but the timed locations next to actual stars is. 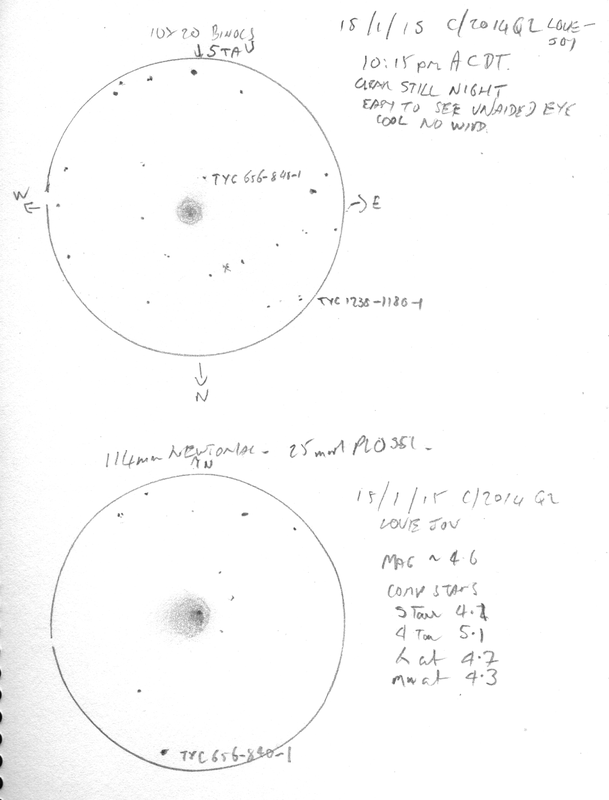 I hope I can get up at 4:00 am to see the close pass to M48 Tuesday morning, also hoping the Mayhill iTelescopes aren't clouded out. The SSO ones are, so unless the skies clear soon I don't think I will get any close approach images form SSO. 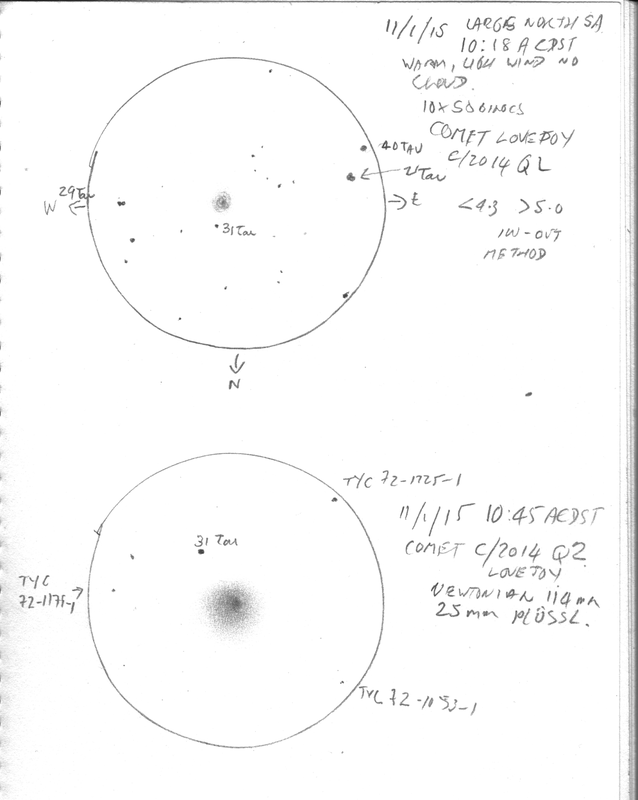 In my previous article on 2004 BL86 I explained in detail how to see this NEO at its brightest ... at around 4:30 am in the morning when it is close to the bright open cluster M48. For those of you who want to see it on the night of the 26th, before heading to bed, I've created these instructions. You will need a telescope, not a fancy one, but a telescope none the less. Finding the asteroid will be harder as it is dimmer, and there is no obvious bright feature to use as a guide. But while harder it is well worth the effort. 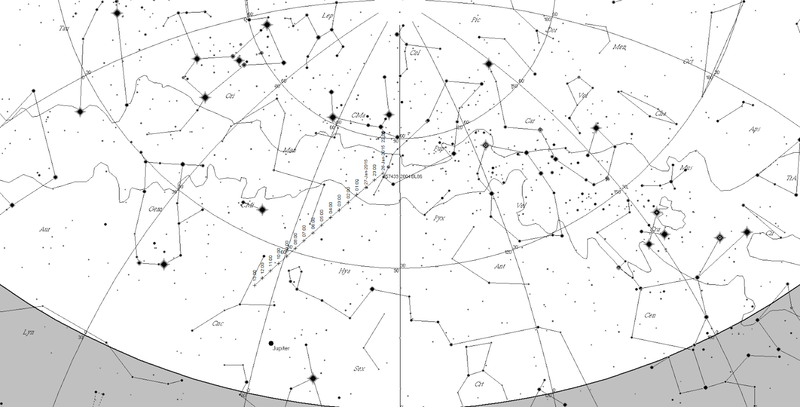 Printable black and white horizon chart facing east an hour and a half after sunset on the 26th showing the location of 2004 BL86 as seen from Adelaide. Similar views will be seen from East coast and central locations at the equivalent local time. WA sees the asteroid further along in its path. 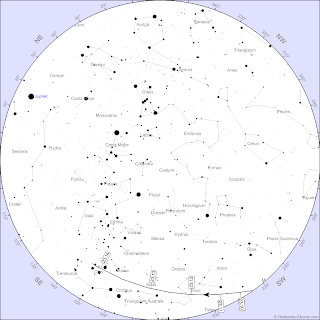 Click to embiggen and print Printable black and white binocular chart showing the location of 2004 BL86 at 22:00 to midnight ACDST on the evening of 26 January 2015 from Adelaide. Similar views will be seen from 22:30 AEDST and 21:30 AEST. 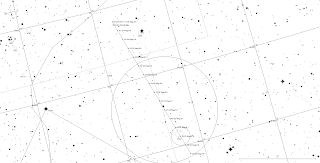 The large circle is approximately the field of view of 10x50 binoculars. The small circle the approximate field of view of a 25 mm eyepiece with a 114 mm Newtonian telescope. Click to embiggen and print. To find the asteroid, again we will use bright stars as a landmark. If you draw a line between Jupiter and Canopus (the brightest and third brightest objects in the sky at this time), then draw a line perpendicular from Sirius (the second brightest object in that part of the sky) to the Jupiter - Canopus line, the intersection is where the asteroid will be. 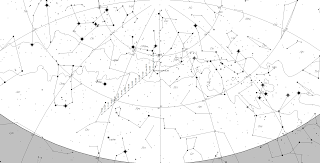 In binoculars or a telescopes finder scope you will see a triangle of stars. 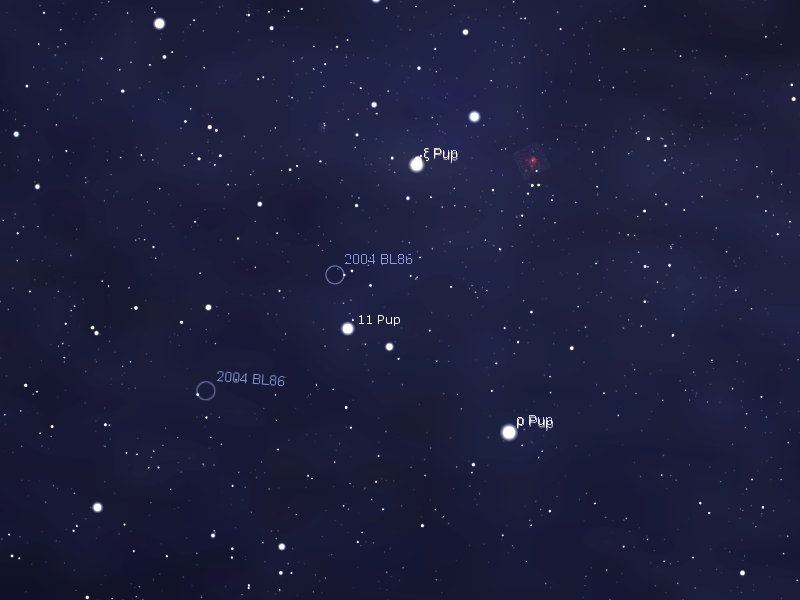 The faint star at the apex of the triangle is 11 Pupis. The asteroid zooms past this star as seen from the eastern and central states. From WA, by the time the sky is darkenough, the asteroid is well below 11 Puppis, but you can use the charts to sweep down and find it. 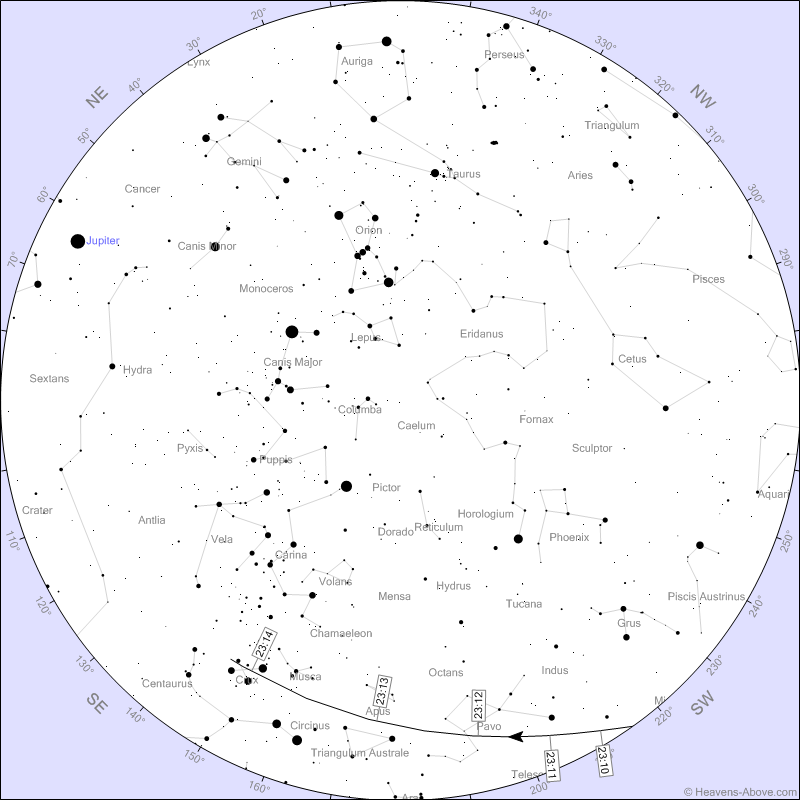 Printable black and white binocular chart showing the location of 2004 BL86 at 22:00 to midnight ACDST on the evening of 26 January 2015 from Adelaide. The circle the approximate field of view of a 25 mm eyepiece with a 114 mm Newtonian telescope. The orientation is upside down from the binocular map as telescopes invert the image. Click to embiggen and print. With your telescope a wide field eye piece, first centre 11 Pupis in the eyepiece, then move it so 11 Puppis is at the western edge of the eyepiece. The asteroid should be visible as a faint dot on the western side, moving slowly but inexorably across the stars. The printable charts above will be needed help you find the asteroid.Remember, when looking for the asteroid allow at least 5 minutes or more (10 is better) for your eyes to adjust and become dark adapted. Here's some hints on dark adaption of your eyes. If using the charts above, cover your torch with red cellophane so as to not destroy your night vision. On the morning of Sunday 25 January I'll be on ABC local radio (Adelaide 891 AM) with Ashley Walsh, going live around 11:40 am ACDST (11:10 AEDST, 10:10 AEST). I'll be talking about the close flyby of Near Earth Asteroid 2004 BL86 and how to see it and what's coming up in 2015. So listen if you can (they doing streaming, so even if you are not in Adelaide you can catch this on your computer). Near Earth Asteroid 2004 BL68 will come close to Earth on 16:20 UT 26 January at distance of 0.008 AU (around 3.1 Earth-Moon distances). It is brightest at 04:00 UT on the 27th though. It has an estimated diameter of 680m (a bit over half a kilometer). The asteroid will be a reasonably bright magnitude 9.0 at closest approach, and it comes close to the iconic Beehive cluster when it is still bright. The flyby of 2004 BL86 will be the closest by any known asteroid of this size until 2027 when asteroid 1999 AN10 goes past Earth. It is also the brightest since 2012 DA14 in 2013. Unfortunately, from Australia the asteroid is below the horizon at its brightest. We get to see it when it is between magnitudes 10-9.6. 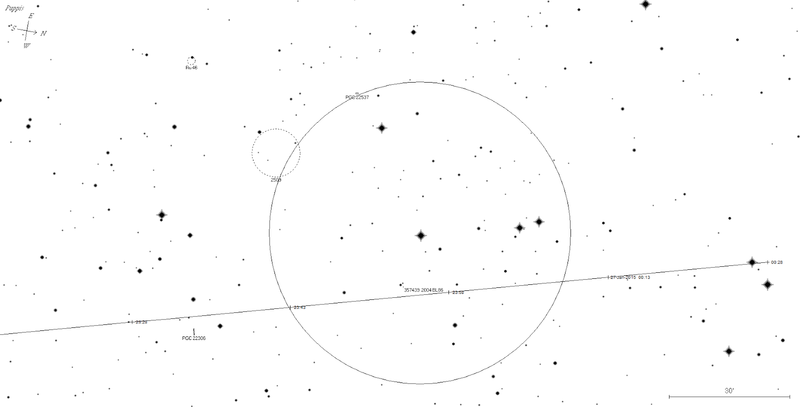 The theshold for unaided eye viewing is magnitude 6, so the asteroid is quite dim. Australians can see the asteroid move from Puppis (on the late evening of the 26th, Australia day) through Monocerous and into Hydras. While the asteroid can be picked up by high end binoculars under dark sky conditions, for most observers small telescopes will be required. My small 114 mm Newtonian with a 25 mm eyepiece allows me to see stars dimmer than magnitude 10. The printable charts above will also help you find the asteroid. For telescope users, the image will be upside down compared to the charts (so hold the binocular/telescope chart upside down). Remember, when looking for the asteroid allow at least 5 minutes or more (10 is better) for your eyes to adjust and become dark adapted. Here's some hints on dark adaption of your eyes. If using the charts above, cover your torch with red cellophane so as to not destroy your night vision. When looking for the asteroid in the early morning, we have a good signpost and viewing opportunity. 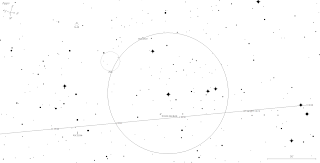 The asteroid comes close to (eastern states) and crosses (western and central states) the relatively bright (magnitude 5.8) open cluster M48 before astronomical twilight. 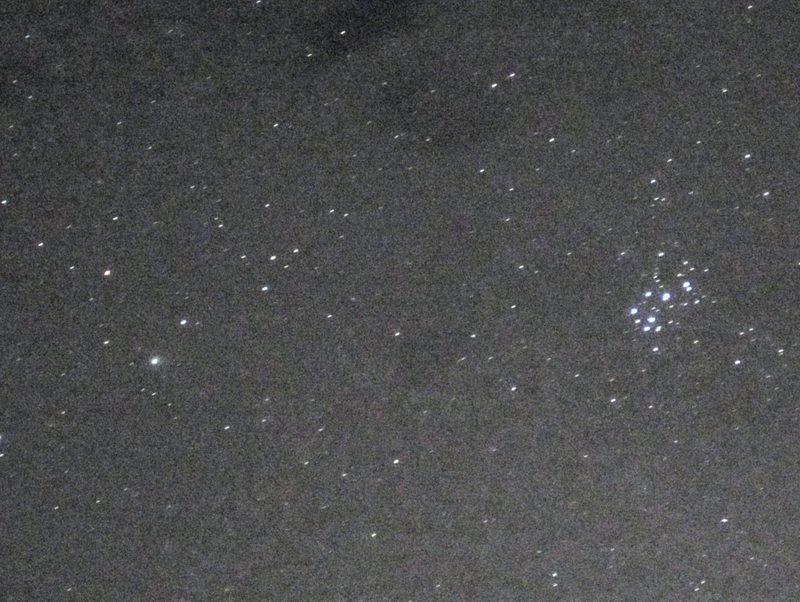 If you find the open cluster then you can camp out on it and watch the asteroid creep towards it. You can find the cluster fairly easily. 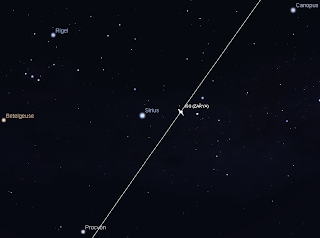 If you draw a line between Jupiter and Sirrius (the two brightest objects in the sky at this time), then draw a line perpendicular from procyon (the third brightest object in that part of the sky) to the Jupiter - Sirius line, you should be able to (just see) M48. It will be quite obvious in binoculars or a telescopes finder scope. With the cluster in view, sweep slowly south around half a field of view at a time. 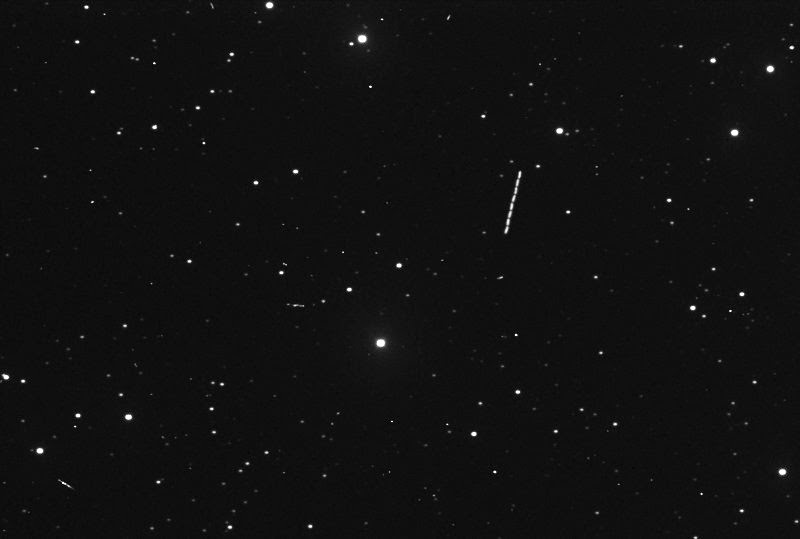 The asteroid may be initially difficult to distinguish as a fairly dim dot, even in a telescope, but it is the only dimmish dot moving slowly and relentlessly towards the cluster. It may take half an hour to cross the field of view of a wide field eye-piece, but it's motion is fast enough to pick it up. 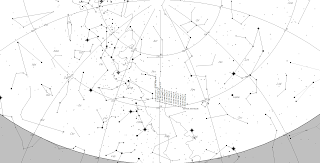 For central states the asteroid crosses the cluster from around 4:40 to 4:50 am ACDST (3:40-3:50 ACST), for Western Australia the asteroid crosses M48 between roughly 2:10 am - 2:20 am AWST (it is much higher in the sky, so easier to pick up in WA). In the eastern states the asteroid is two cluster widths away from M48 at astronomical twilight (roughly 3:48 am AEST and 4:36 am AEDST). Use your longitude and latitude for an ephemeris for your location, remember the times are in UT adn it is best to choose and observing interval of around 15 minutes as the asteroid is moving relatively quickly. Here's some NEO's I've captured in the past. Venus and the crescent Moon imaged at around 21:15 ACDST form Largs North, using my Canon IXUS ASA 400, 1 sec exposure. click to embiggen. The paired imaged on 3X Zoom, then the image cropped to emphasise the pair. Click to embiggen. After returning from putting EldestOne on a Melbourne bound bus to start sorting out some Uni things, I saw the most gorgeous sunset. Despite the clouds, I was able to capture Venus and the crescent Moon. Unfortunately, Mercury had sunk in the horizon murk by the time the clouds let me see the planets. was the value associated with this mornings display). allow around 5 minutes for your eyes to become dark adapted. Evening sky on Thursday January 22 looking west as seen from Adelaide at 21:00 (9:00 pm) ACDST in South Australia. 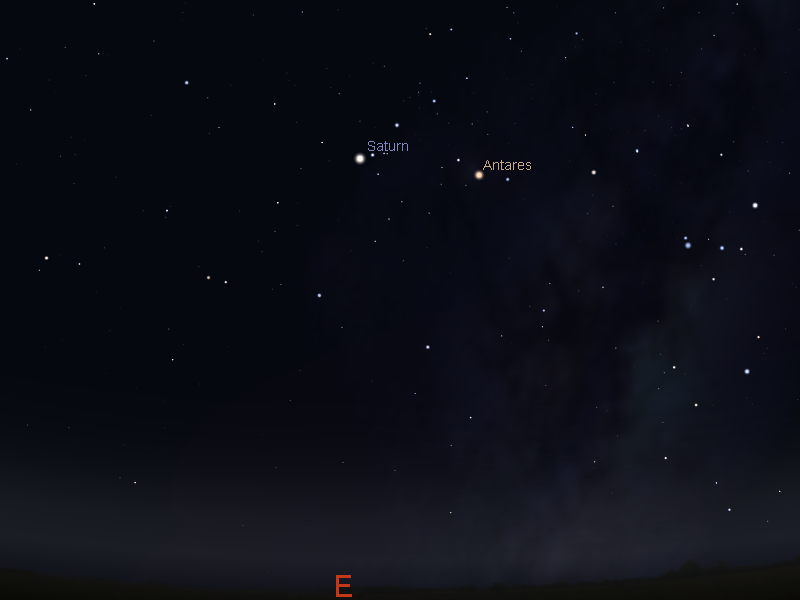 Mars is low in the twilight, with Venus and the Moon close together below. Mercury is deep in the twilight. Similar views will be seen elsewhere at the equivalent local time (click to embiggen). Just a reminder that on the 22nd Venus, the thin crescent Moon and Mercury form a triangle low in the twilight. While Venus is bright you will still need a reasonably flat, clear horizon to see all three objects, although you may need binoculars to see Mercury. Venus provides a helpful signpost to finding Mercury which is below and to the left of Venus. The First Quarter Moon is Tuesday January 27. 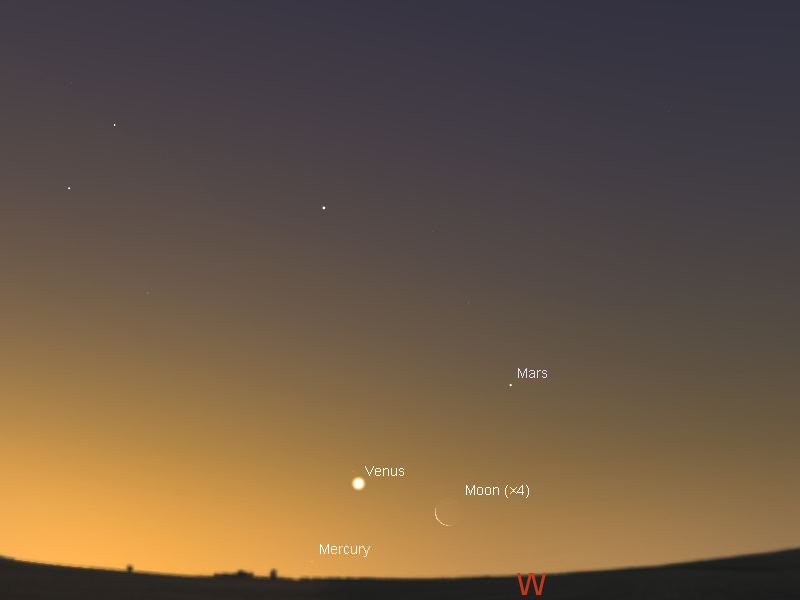 Venus is prominent in the twilight evening sky while Mercury falls back to the horizon. The pair are visited by the Moon on Jan 22. 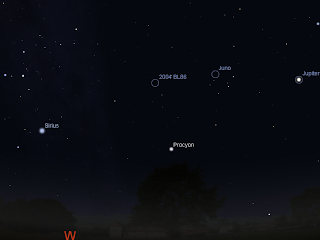 Mars is just visible in the early evening and is visited by the Moon on Jan 23. Jupiter is visible in the late evening sky. Comet C/2102 Q2 Lovejoy is lost from view. Saturn is in the head of the Scorpion. The First Quarter Moon is Tuesday January 27. Mercury is low in the twilight, and by the end of the week will be too hard to see. Venus provides a helpful signpost to finding Mercury which is below and to the left of Venus. On the 22nd Venus, the thin crescent Moon and Mercury form a triangle, although you may need binoculars to see Mercury. You will need a reasonably flat, clear horizon to see it. Venus is now easy to see low on the western horizon in the twilight. At civil twilight, half an hour after sunset, it is well over a hand-span above the horizon. While Venus is bright you will still need a reasonably flat, clear horizon to see it, although as the week goes by it is easier and easier to pick out. On the 22nd Venus, the thin crescent Moon and Mercury form a triangle. Mars is still seen low in the western evening sky, setting before 10:30 pm daylight saving time (shortly after twilight ends). Mars is becoming harder and harder to see as it lowers deeper into the twilight. On the 23rd the crescent Moon is close to Mars. Morning sky on Saturday January 24 looking east as seen from Adelaide at 5:00 am ACDST . Saturn is in the head of the Scorpion, not far from Antares at this time. (click to embiggen). Saturn climbs higher in the morning sky. It is now easily visible in the early twilight near the head of the constellation of the Scorpion not far from the bright red star Antares. The sight of the distinctive constellation of the Scopion curled above the horizon, with bright Saturn in its head, is very nice indeed. Jupiter is prominent in the morning sky, and is easy to see as the brightest object above the northern horizon before twilight. It is now not far from the bright star Regulus in the sickle of Leo (this forms the head of the constellation of the Lion). Jupiter is high enough for good telescopic observation before astronomical twilight. Jupiter's Moons will be putting on a good display in both binoculars and small telescopes. Jupiter enters the evening sky just before 10 pm daylight saving time, where it is the brightest object above the north-eastern horizon. It is now in a decent position for telescope viewing just before midnight, although still best in the early morning. Evening sky on Sunday January 25 looking north as seen from Adelaide at 22:00 (10:00 pm) ACDST in South Australia. 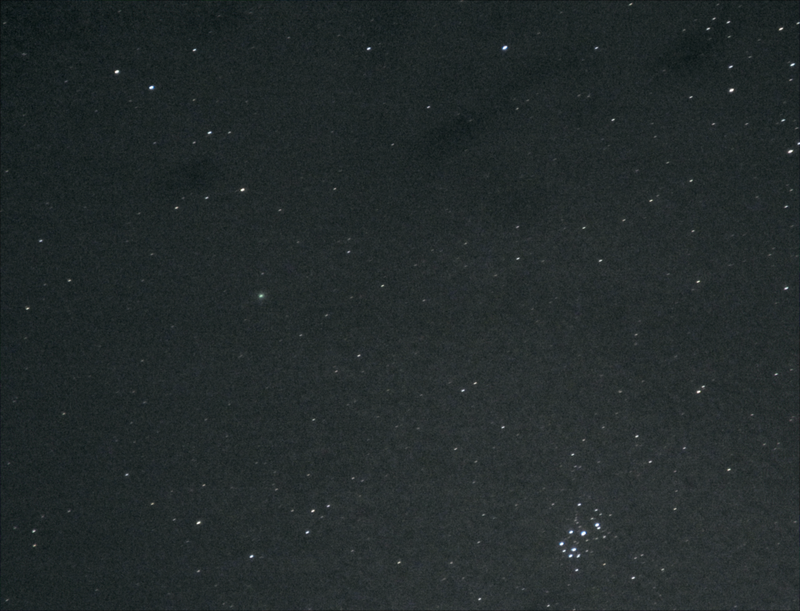 Comet C/2014 Q2 Lovejoy is below the Pleiades. Similar views will be seen elsewhere at the equivalent local time (click to embiggen). C/2014 Q2 Lovejoy is dimming in the sky. This will be the least week we can effectively see the comet before it passes completely into northern hemisphere skies. While the comet is reasonably bright now (estimates between magnitude 4.0 and 4.5) it is slowly fading as it heads towards the horizon where horizon murk makes it even harder to see. Also this week the Moon brightens compounding the comets visibility difficulties. It is still easily visible in binoculars but will be much more difficult to see by the weeks end. Binoculars or small telescopes show it as a definite fuzzy disk about a quarter of the size of the Moon. In modest sized telescopes the faint thin tail can be seen. 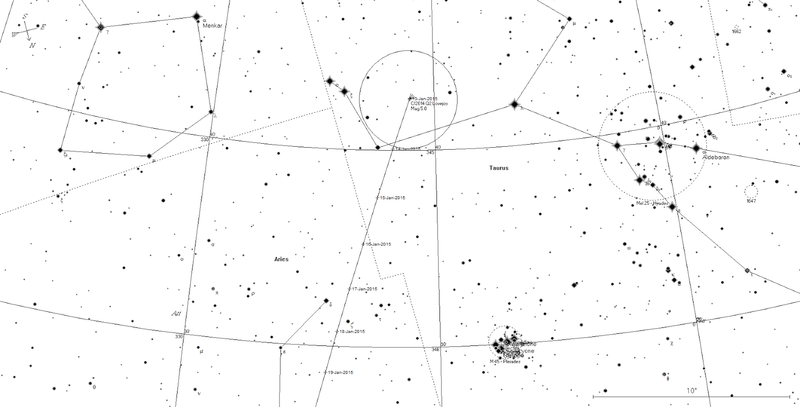 Instructions on viewing the comet and printable finding charts can be found here. Comet C/2014 Q2 Lovejoy on the 19th of January as seen from Adelaide at Astronomical twilight (an hour and a half after sunset). 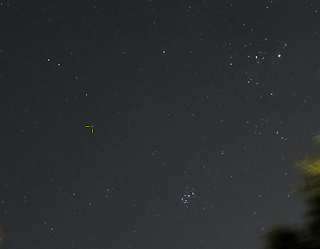 It is not far from the Pleiades, and people with serious astrophotography kit may capture the tail as it passes over the Pleiades (click to embiggen). 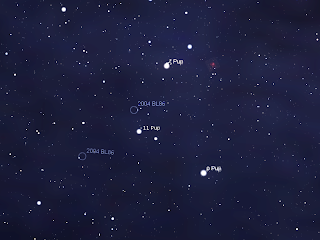 Over the past few days comet C/2014 Q2 Lovejoy has been edging closer to the beautiful star cluster the Pleiades. They were closest last night, on the 18th, but tonight they will still be close, a bit too far to get in one binocular field, but very nice both in the sky and binoculars. 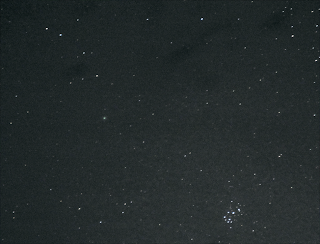 My slightly rubbish image of the comet and the Pleiades from last night. If you click and embiggen the image, you might just possibly see the hint of a tail. or not. However, if you have some serious camera kit, you might just be able to get the comets tail crossing the Pleiades. Here's Chris Wyatt's image of the 17th. With a good DSLR you should be able to pick it up too. The tail has been an absolute delight in astrophotographs, barely visible to the eye in telescopes though. So, go out tonight and have a look. People in Southern Australia have a fairly narrow window before the comet is too low to the horizon (from about 10:00 pm to 11:30 pm), but northern Australians have a better view. Comet Lovejoy imaged with my Canon IXUS. A stack of 10x15 second images at ISO 800. The comet is indicated by the yellow lines (click to embiggen) Comet Lovejoy imaged with my Canon IXUS. A stack of 10x15 second images at ISO 800 and 3x zoom. The comet is pretty obvious in this one (click to embiggen). Tonight's sketches, click to embiggen. After days of cloud and rain I finally got to see Comet C/2014 Q2 Lovejoy again. This time the comet was really obvious to the unaided eye. I had to use averted vision to start with, but even then it was a lot easier to pick up than on the 11th (see images from the 11th here). It might have been better sky conditions, or a less crowded patch of sky that made it easier to see. But my magnitude estimate using the 10x50 binoculars was dimmer than for the 11th (4.5, using 4 Tau M5, 5 Tau M4.1 Lambda Cet 4.7 and mu Cet 4.3 as comparison stars). In binoculars the comet was round and fuzzy, no hint of tail structure. In the telescope (114mm Newtonian with 25mm Plossl eyepiece) the coma was clearly asymmetrical, but no clear tail. There was a well defined central condensation. Size still looked the same as last time. Yet again I neglected to measure the coma size. This time I was unable to image the comet with the telescope, by the time I could set up the camera the comet was too low in the sky and the camera unbalanced the scope. 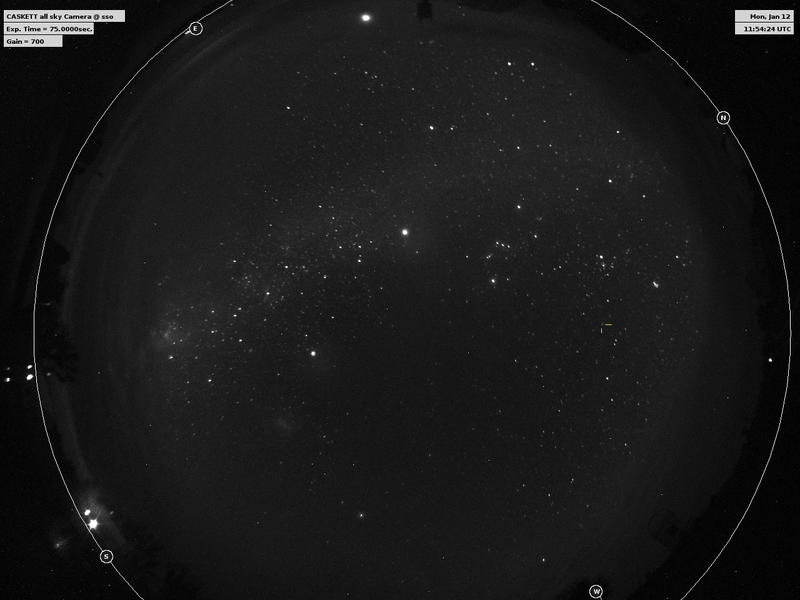 Finally to round off the night, this image from the iTelescopes all sky camera at the Siding Spring Observatory, shows comet C/2014 Q2 Lovejoy near Taurus. Click to embiggen. The comet is indicated by the yellow lines. 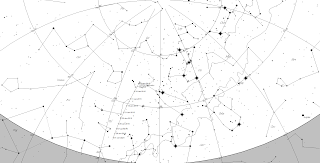 All sky chart showing local times from Heavens Above for Wednesday January 15 for Adelaide. 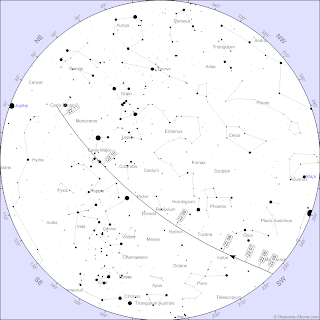 All sky chart showing local times from Heavens Above for Tuesday January 20 for Adelaide. 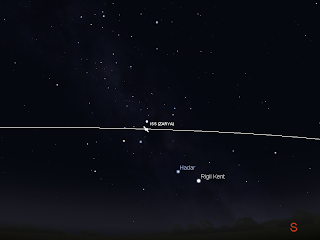 The ISS passes near the Southern Cross, as seen from Adelaide on the evening of Wednesday January 15 at 22:44 ACDST. 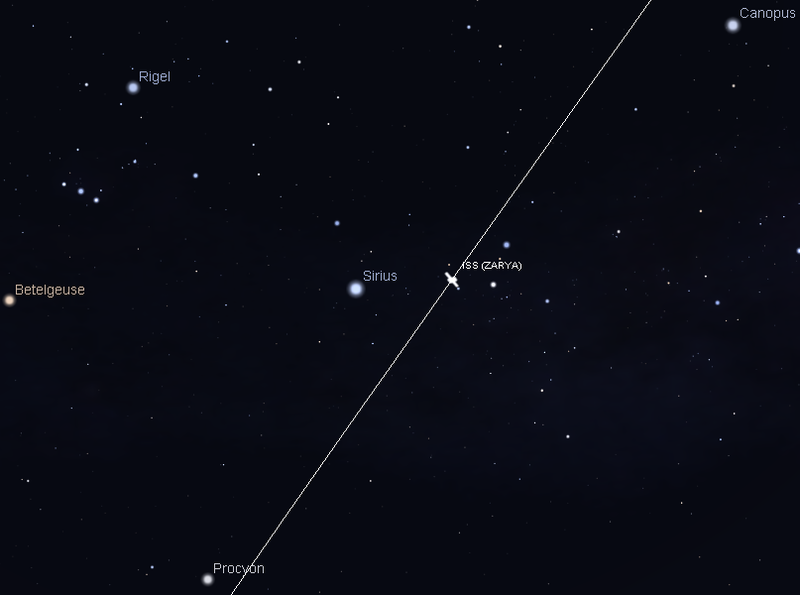 Simulated in Stellarium (the ISS will actually be a bright dot), click to embiggen. The ISS passes near Sirius, as seen from Adelaide on the evening of Tuesday January 20 at 21:40 ACDST. 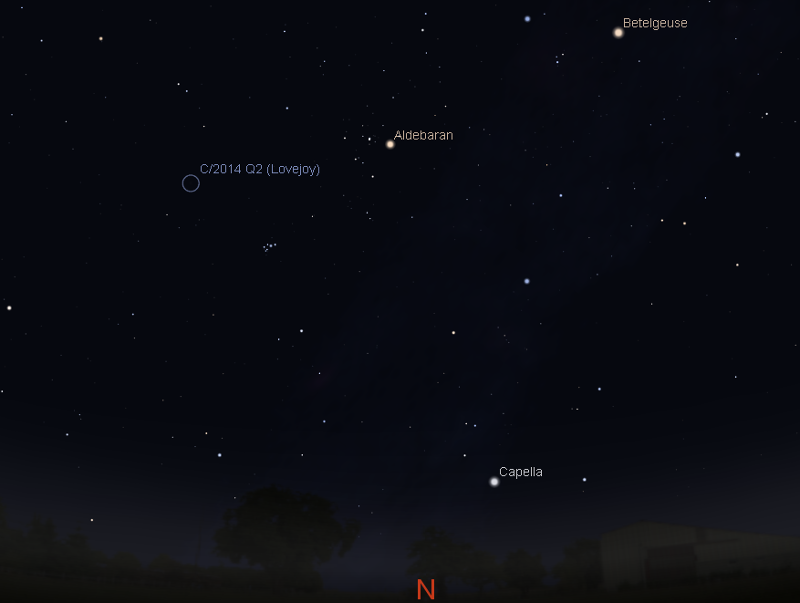 Simulated in Stellarium (the ISS will actually be a bright dot), click to embiggen. 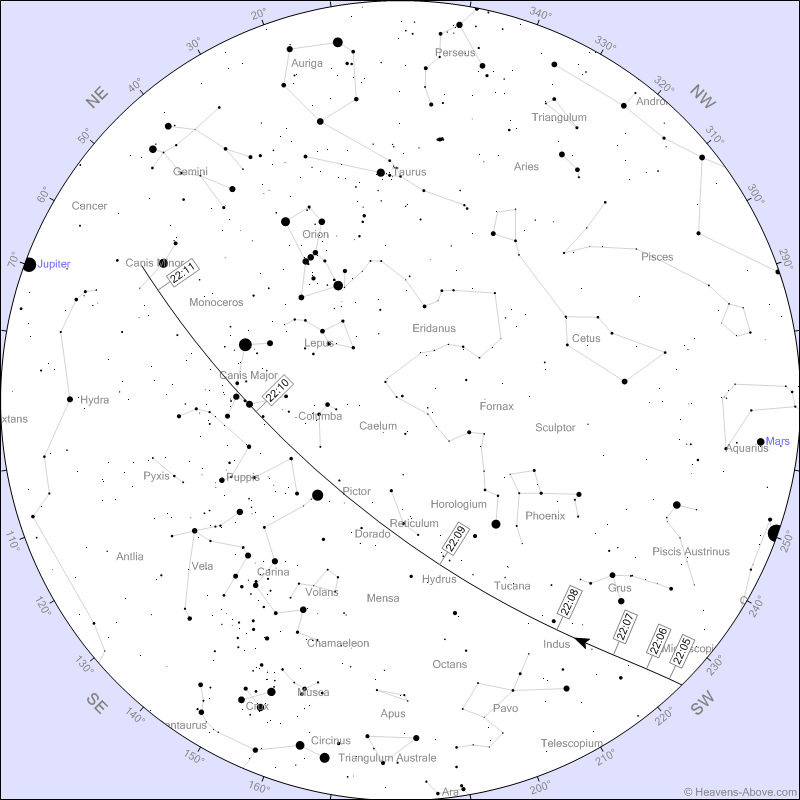 Starting tonight there are a series of bright evening passes of the International Space Station lasting at least the 23rd. For many places in Southern Australia this series has the ISS gliding either above, through or under the Southern Cross, depending on where you are. On the 20th there is a bright pass which takes the ISS close to the bright star Sirius (in Melbourne it passes close to Orion's Belt instead). Some of the passes are very short although bright as the ISS enters Earth's shadow, but it is interesting to see the ISS wink out abruptly. When and what you will see is VERY location dependent, so you need to use either Heavens Above or CalSky to get site specific predictions for your location (I'm using Adelaide only as an example as ther are just too many of them). Start looking several minutes before the pass is going to start to get yourself oriented and your eyes dark adapted. Be patient, on the night there may be slight differences in the time of the ISS appearing due to orbit changes not picked up by the predictions. 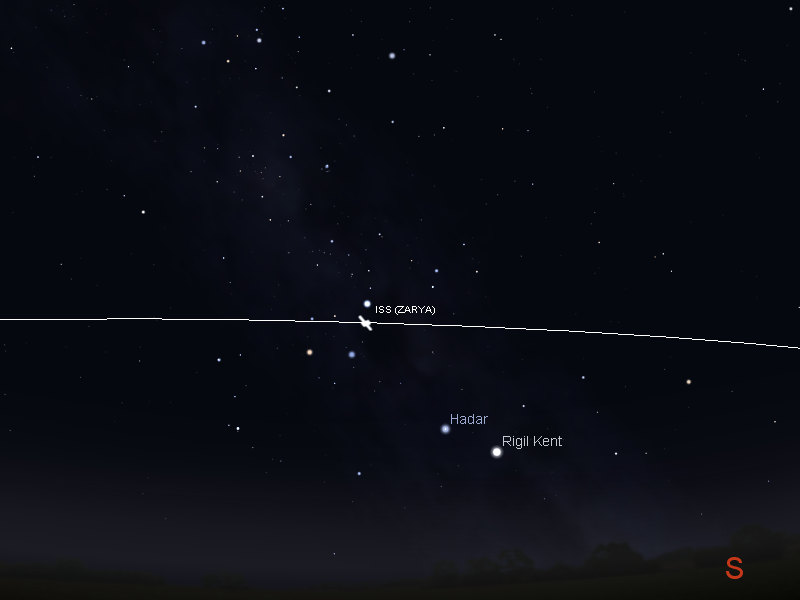 The ISS will be moving reasonably fast when it passes the Southern Cross and Sirius, so viewers should be alert as the ISS comes up from the horizon very quickly. The Australian IPS has issued a Aurora watch alert for the next 48 hours due to a coronal mass ejection. As always look to the south for shifting red/green glows, in yesterdays event curtains and beams were reported. As usual, dark sky sites will have the best chance of seeing anything, and always allow around 5 minutes for your eyes to become dark adapted. should favourable space weather activity eventuate. The New Moon is Tuesday January 20. 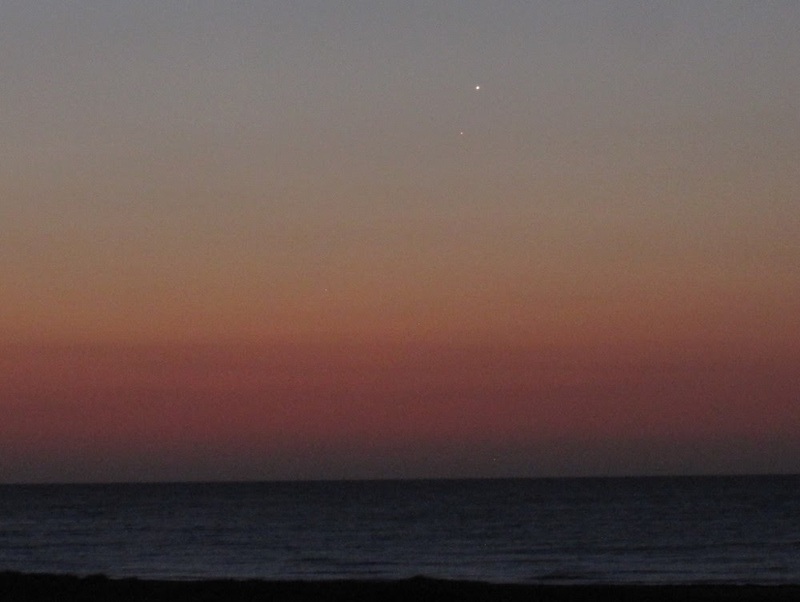 Venus is prominent in the twilight evening sky while Mercury falls back to the horizon. Mars is just visible in the early evening. Jupiter is now higher in the evening sky. 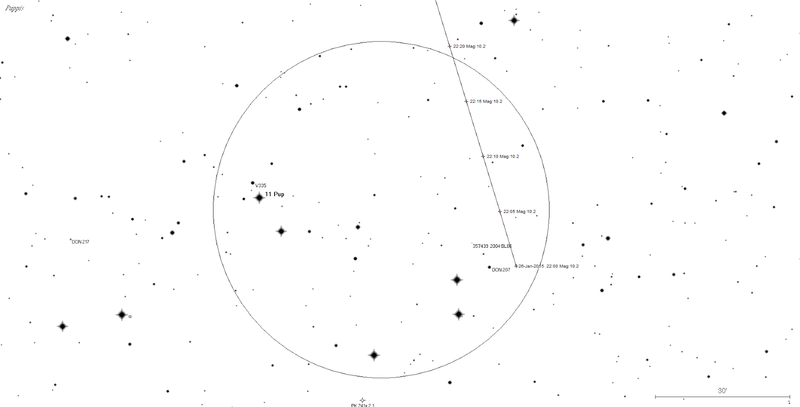 Comet C/2102 Q2 Lovejoy is easily visible in binoculars in the early evening is and visible to the unaided eye. Saturn is in the head of the Scorpion and visited by the crescent Moon on the 17th. The New Moon is Tuesday January 20. The Moon is at perigee, closest to the Earth, on the 22nd. Evening sky on Saturday January 17 looking west as seen from Adelaide at 21:00 (9:00 pm) ACDST in South Australia. 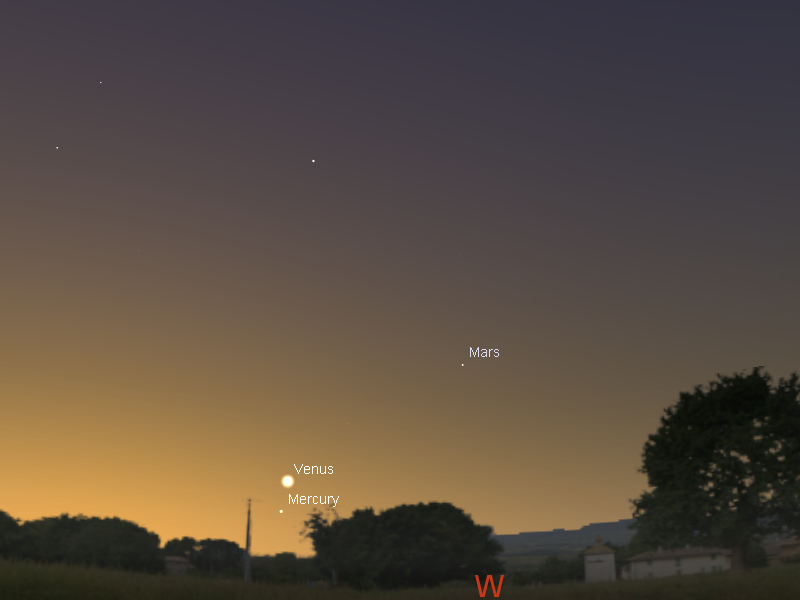 Mars is low in the twilight, with Venus and Mercury close together below. 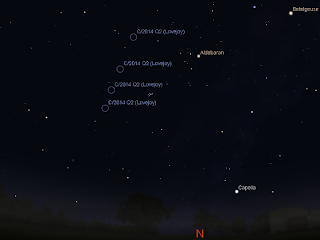 Similar views will be seen elsewhere at the equivalent local time (click to embiggen). Mercury is low in the twilight, and starts the week not far from Venus. Venus provides a helpful signpost to finding Mercury. It is visible 40 minutes after sunset, although it might not be obvious at first. Look a bit below and to the left of Venus. As the week goes on Mercury falls away from Venus into the twilight. Venus is now easy to see low on the western horizon in the twilight. At civil twilight, half an hour after sunset, it is well over a hand-span above the horizon. While Venus is bright you will still need a reasonably flat, clear horizon to see it, although as the week goes by it is easier and easier to pick out. Mercury and Venus were at their closest on Sunday the 11th when they were just a finger-width apart. However the pair are nicely close at the start of the week, then slowly draw away. Mars is still seen low in the western evening sky, setting around 10:30 pm daylight saving time (shortly after twilight ends). Mars is becoming harder and harder to see as it lowers deeper into the twilight. Mars is in the constellation of Capricornius. Morning sky on Saturday January 17 looking east as seen from Adelaide at 5:00 am ACDST . 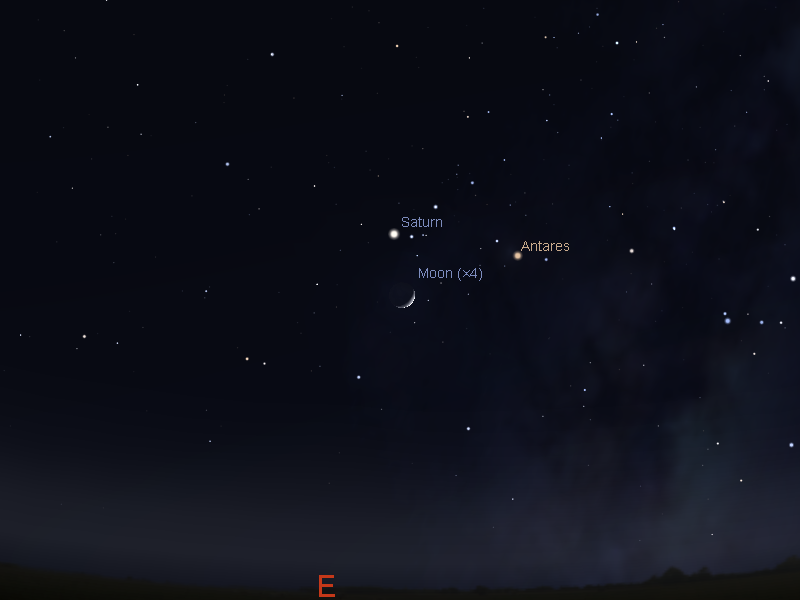 The crescent Moon is close to Saturn and Antares at this time. (click to embiggen). Saturn climbs higher in the morning sky. It is now easily visible in the early twilight near the head of the constellation of the Scorpion. 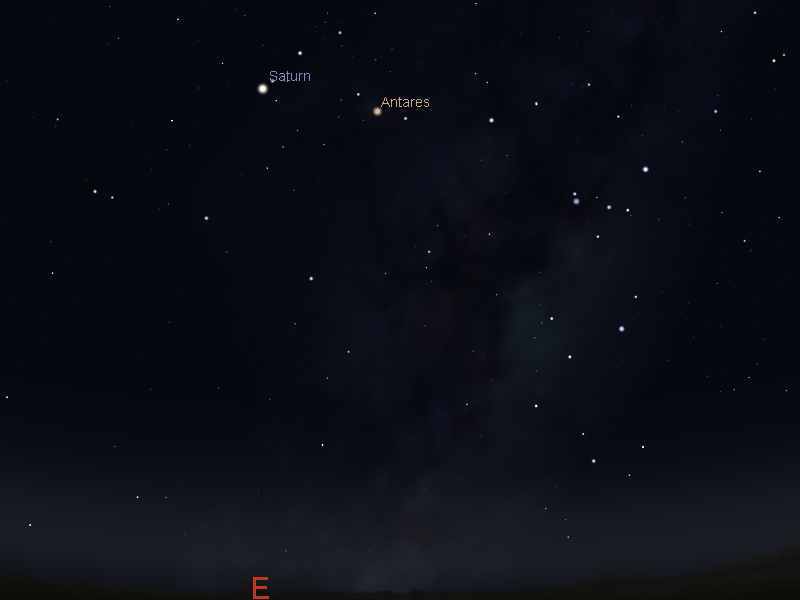 The crescent Moon is close to Saturn and the bright red star Antares on Saturday January 17. Jupiter is prominent in the morning sky, and is easy to see above the horizon before twilight. Jupiter is the brightest object above the northern horizon. It is now not far from the bright star Regulus in the sickle of Leo (this forms the head of the constellation of the Lion). 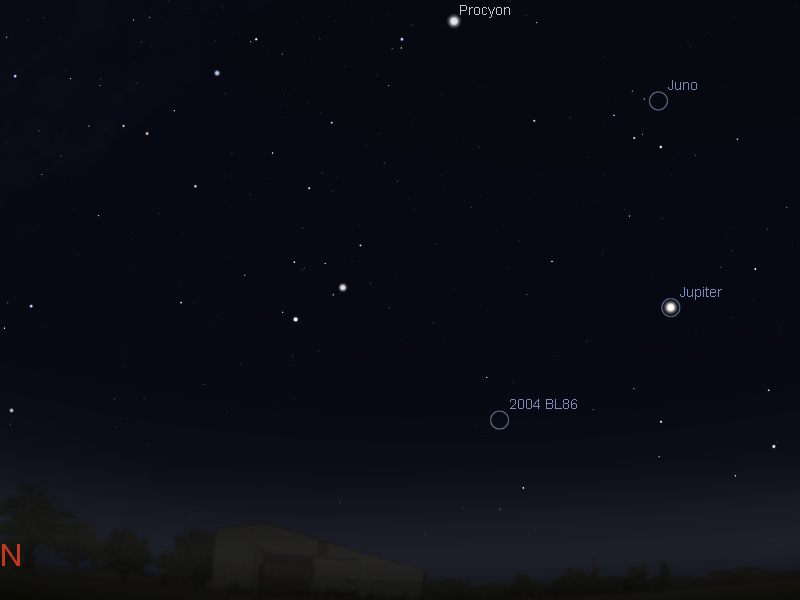 Jupiter is now high enough for good telescopic observation before astronomical twilight. 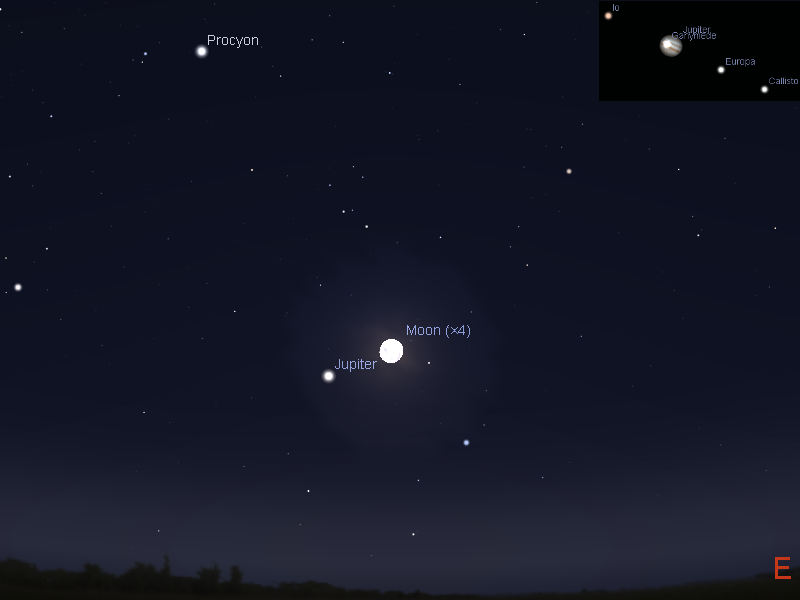 Jupiter's Moons will be putting on a good display in both binoculars and small telescopes. Jupiter enters the evening sky just before 10 pm daylight saving time, and is now in a decent position for telescope viewing just before midnight, although still best in the early morning. Evening sky on Friday January 16 looking north as seen from Adelaide at 22:00 (10:00 pm) ACDST in South Australia. 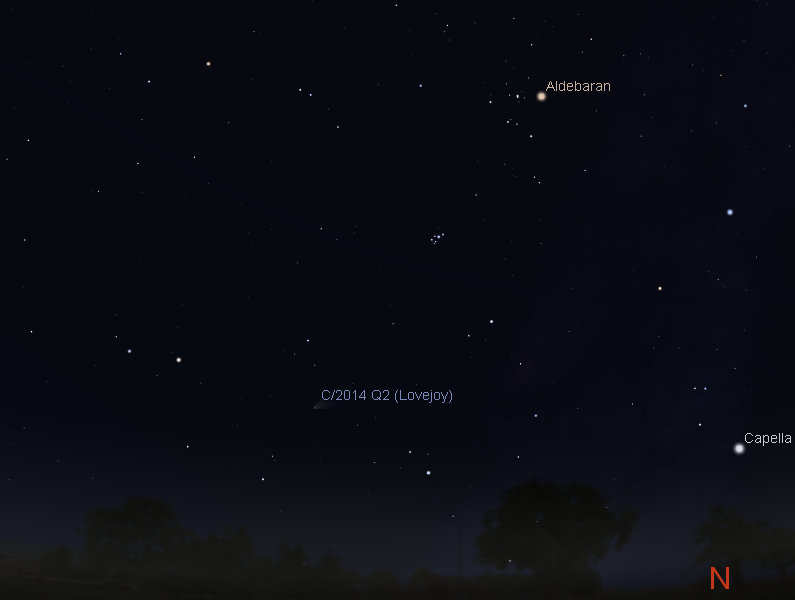 Comet C/2014 Q2 Lovejoy is to the left of Aldebaran and the Hyades. Similar views will be seen elsewhere at the equivalent local time (click to embiggen). 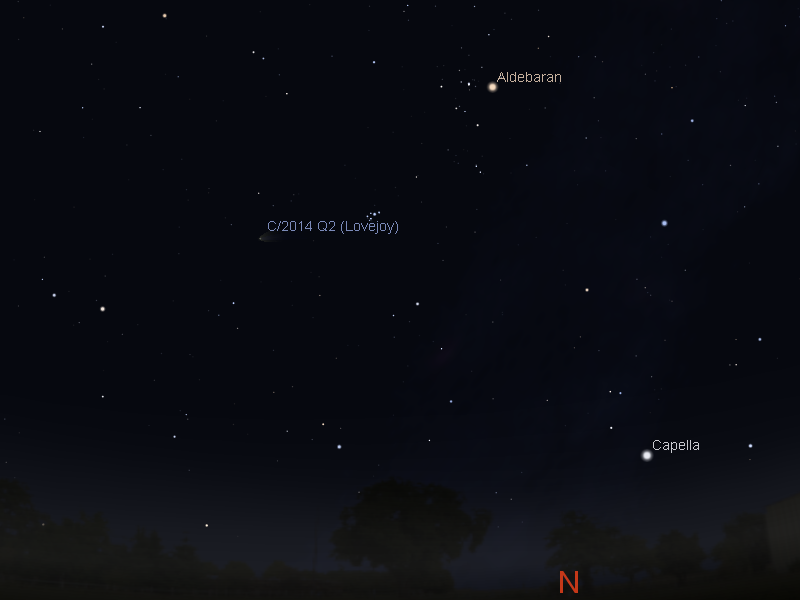 C/2014 Q2 Lovejoy is now dimming in the sky after being brightest on the 11th. The comet is passing Taurus heading towards Aries. While the comet was brightest on January 11, it is reasonably bright now (estimates between magnitude 4.0 and 4.5) and the rest of the week. It is easily visible in binoculars and people in subsurban sites have been able to see it with the unaided eye. Binoculars or small telescopes show it as a definite fuzzy disk about a quarter of the size of the Moon. In modest sized telescopes the faint thin tail can be seen. 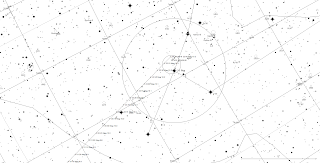 Instructions on viewing the comet and printable finding charts can be found here. With the waning Moon rising in the early morning this is an excellent time to view comet C/2014 Q2 Lovejoy has a chance to shine again. Comet Lovejoy has been easy to see in binoculars and even visible to the unaided eye in mildly light polluted suburban locations. While the comet has passed maximum brightness it will only slowly fade and will be good to view for the next week. It is seen as a dimmish fuzzy star with the unaided eye. In binoculars it looks like a large ball of cotton wool and in even small telescopes a thin faint tail can be seen under dark skies. As it heads toward its closest approach to the sun it may develop a dust tail which will be more easily seen in telescopes. 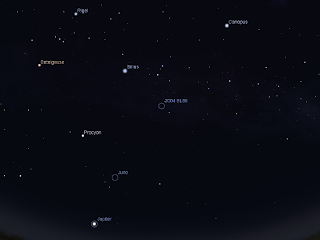 For the next 7-8 days the obvious constellation of Taurus are your guide to finding the comet. The comet is currently around magnitude 3.8 - 4.2 (a bit dimmer than the 5th star of the Southern Cross) and may stay as bright as 4.5 until the end of the week. 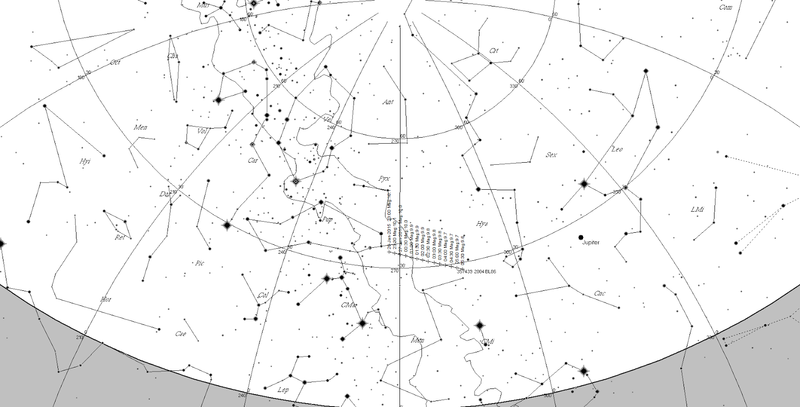 Printable black and white binocular chart an hour and a half after sunset showing the location of comet C/2014 Q2 Lovejoy. The circle is approximately the field of view of 10x50 binoculars. Click to embiggen Comet Lovejoy on 11 January 2015. 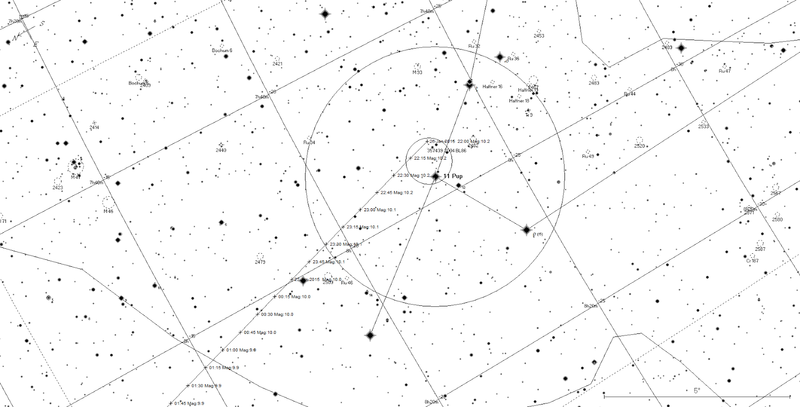 The comet is near Taurus (indicated with yellow lines). This is a stack of 10x15 second images taken with my Canon IXUS, ASA 400. Click to embiggen. If you go out an hour and a half after sunset when the sky is dark (a little after 10:15 pm daylight saving time in most of Australia), and look north-east you will see the distinctive shape of the "saucepan" almost dead ahead of you. 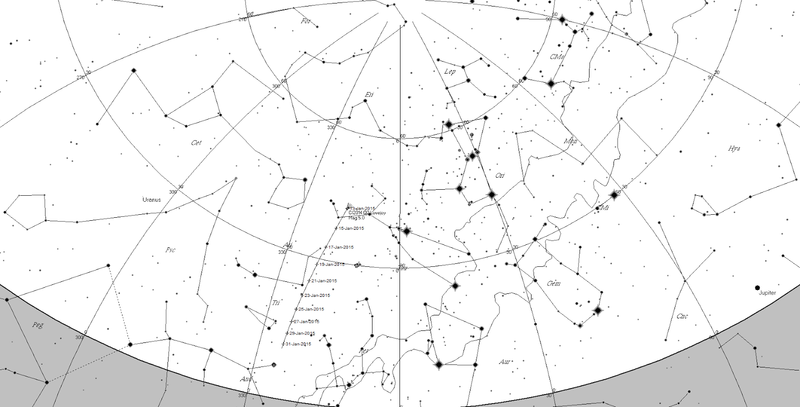 Below and to the left (almost due north) is Taurus the Bull. For the first few days the comet is nestled between the legs of Taurus the Bull. Start your sweep at the red star Aldebaran, at the bottom of the obvious inverted "V" that is the head of Taurus. Sweep slightly up and to the left, a bit over a hand-span and you will see a U shaped group of faintish stars. The "U" shape is where the comet will be (either inside or just below it). From the 16th to the 20th the Peliades will be your guide. 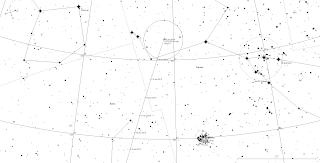 This small obvious cluster of stars is below and to the left of the inverted V that is the head of Taurus (see charts above for a guide). Sweep left by about a hand-span from the Pleiades. 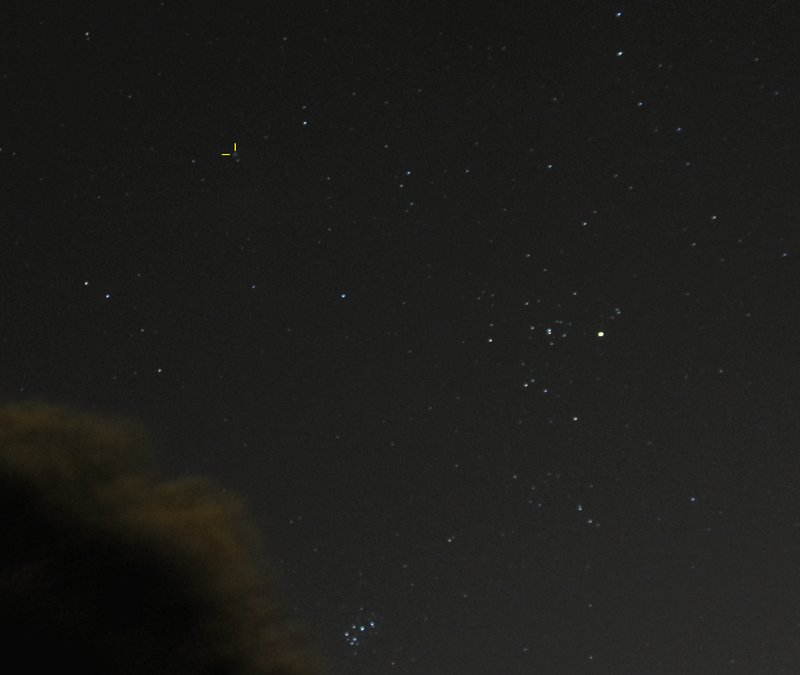 The comets visible appearance in binoculars and a small telescope. Click to embiggen. There are no bright globular clusters in this area so the comet is distinctive as a fuzzy star to the unaided eye, and an obvious large fuzzy ball in binoculars or telescopes. You may need to locate it in binoculars before you are confident of a visual sighting. If you watch on consecutive days you can see the comet move. Once again, the printable charts above can help you with your quest. For telescope users, the image will be upside down compared to the charts. Remember, when looking for the comet allow at least 5 minutes or more (10 is better) for your eyes to adjust and become dark adapted. Here's some hints on dark adaption of your eyes. If using the charts above, cover your torch with red cellophane so as to not destroy your night vision. And be patient, you may not catch it at first, but spend a little time looking and it may pop out at you. 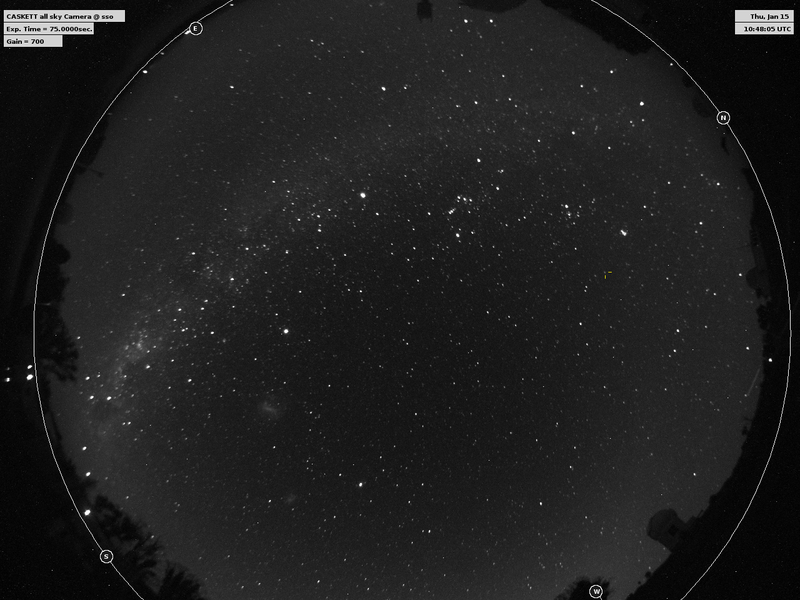 The weather has stopped the iTelescopes at the Siding Spring Observatory from being rolled out, but this image from the all sky camera, before the cloud moved in, shows comet C/2014 Q2 Lovejoy near Taurus. Venus and Mercury head towards the horizon at twilight. Image taken with my Canon IXUS, 1 second 400 ASA, around 21:15 ACDST. 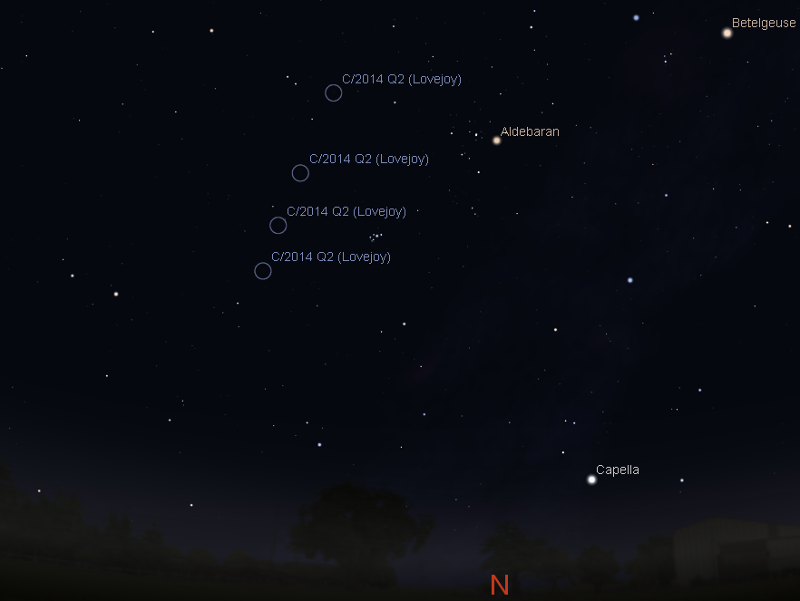 In all the excitement of comet Lovejoy yesterday the Venus-Mercury conjunction goit eft out. But I saw it, and it was beautiful. You may wish to click on the picture to embiggen to see Mercury more clearly. Of course, it is raining again. Latest C/2014 Q2 Lovejoy from iTelescope T14 10 July 01:20 UT. 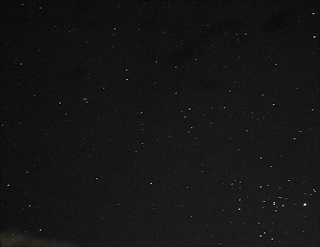 5x180 second luminance frames, median stack, east top north right. Click to embiggen. In contrast this is a stack of 5x1 second images (ISO 1600) of the comet taken with my Canon IXUS through my 114 mm Newtonian with 25 mm Plossl infinity to infinity focussing. Not flash, but I did it! Bright star is 31 Tau. An epic night of comet C/2014 Q2 Lovejoy observation has come to a close. After days of pouring rain and cloud, it all suddenly cleared this afternoon and I finally got to see the comet with my unaided eye. It was tricky at first and I needed, but once I had become familiar with the area it was pretty easy to see. Distinguishing it from 31 Tau was tricky, but Fuzziness was the key. Comet Lovejoy imaged with my Canon IXUS. A stack of 10x15 second images at ISO 400. The comet is indicated by the yellow lines (click to embiggen) Comet Lovejoy imaged with my Canon IXUS. 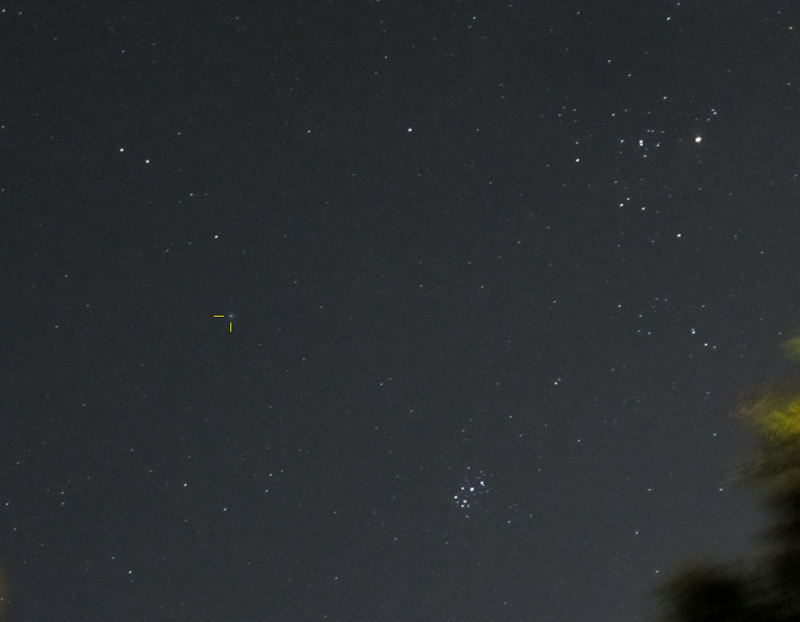 A stack of 10x15 second images at ISO 400 and 3x zoom. The comet is pretty obvious in this one (click to embiggen). This heralded a frenzy of binocular sketching, telescope sketching, and photography. 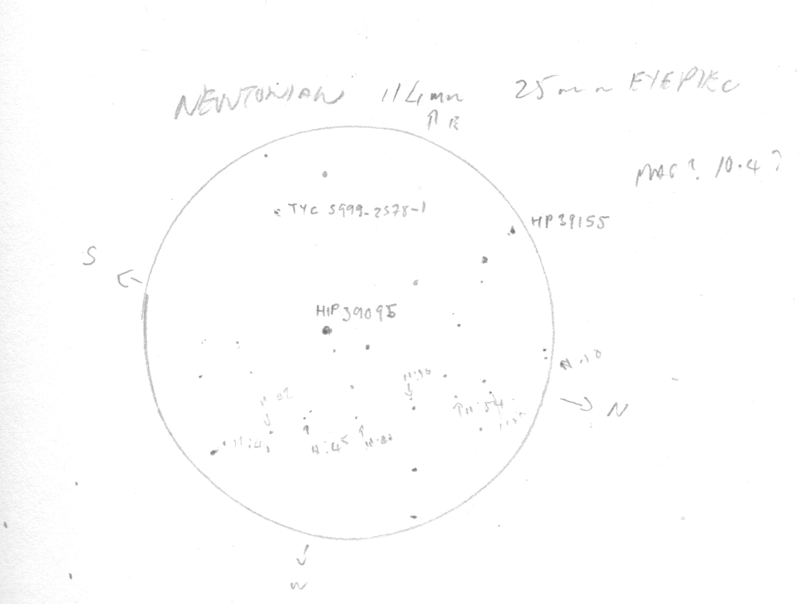 I was pleased with my sketches, my sketched star positions agree pretty well with the charts when I checked them later. In binoculars the comet was round and fuzzy, no hint of tail structure. In the thelescope (114mm Netwonian with 25mm Plossl eyepiece) the coma was clearly asymmetrical, but no clear tail. There was a well defined central condensation. 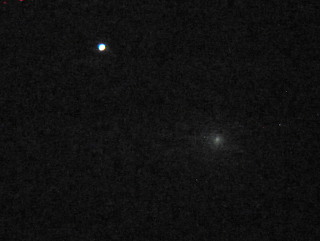 Finally I managed to image the comet through my telescope (the small Newtonian without time drive). It is a pretty ordinary image, but I am chuuffed that I achieved it (only because it was close to a bright guide star). So all in all an epic night. I doubt the weather will hold out, but if I can do more of these observations I will.